According to Outpost Gallifrey, The Sci-Fi channel has announced that Season Three of Doctor Who will begin its US premiere run on July 6th. The Runaway Bride debuts at 8pm and is immediately followed by Smith and Jones at 9.30pm. Both programmes are repeated starting at 11.30pm. The premieres come after a day of Doctor Who on the channel, with Season Two episodes being shown from 6am until 4pm. Also in the UK, gay Whovians were spared having to make a horrible decision by some quick thinking on the part of the London Pride Festival’s organizers. As reported by PinkNews, the final episode of Series Three of Doctor Who, The Last of the Time Lords, is being broadcast on the same day as the London Pride Festival, held in Trafalgar Square. Organizers of the event, in an effort to not make gay Who fans choose between the annual celebration and the season finale of their favourite show, have come up with an interesting compromise: they plan to carry the live BBC broadcast of the episode at 7:10 p.m. on a big screen at the event’s main stage in Trafalgar Square. And if that’s not enough to get gay fans out to the event, they’ve also arranged to have John Barrowman co-host the event with Graham Norton. 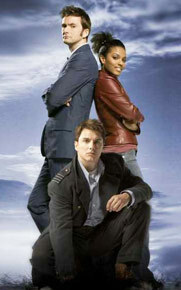 Barrowman will be speaking earlier in the afternoon about his role as Captain Jack on Doctor Who and Torchwood. The event kicks off at 3:00 following the Pride parade through town and concludes with the broadcast of The Last of the Time Lords. Wow, London Pride with Captain Jack. The only thing better would be a big pink TARDIS materializing in Trafalgar Square. I cannot WAIT for the new episodes! This is gonna be the best season of the new Who yet.